What’s The Best Deal On Catching A Ball Game? On average, a family of four attending a Hartford Yard Goats game at Dunkin Donuts park will spend $92. 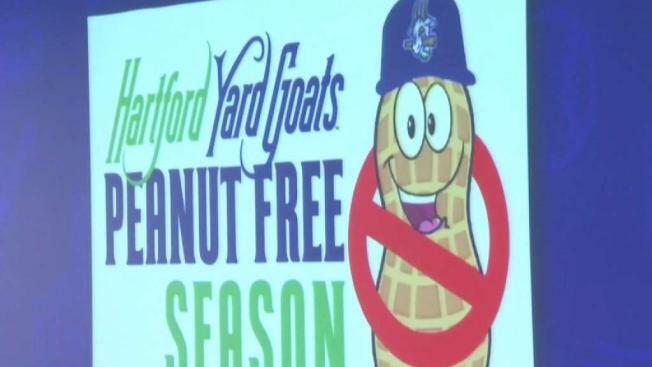 After talking with families who have children with peanut allergies, the Yard Goats have decided to eliminate peanuts and Cracker Jack from their food items for sale this season. Spring is a sure sign that baseball season has sprung, with the Hartford Yard Goats stepping up to the plate to play ball at Dunkin' Donuts park. Some enjoy the game in person with a hot dog and a beer. But will you hit a home run when it comes to the price? That depends on where you go. Some ballparks hit your wallet more than others. Staying in town may not break the bank. “We have a higher repeat business rate than most ballparks because people come out, they find out how easy it is, how fun it is, how affordable it is, they come back,” said Mike Abramson, General manager, Hartford Yardgoats. On average, a family of four attending a Hartford Yard Goats game at Dunkin' Donuts park will spend $92. The price breaks down this way: $5 for parking. $3 each for a hot dog. $6 each for advanced tickets. $4 each for a soda. Beer starting at $6. And starting at $20 for a souvenir cap. “It’s just the ability to come out at a really fair price point and have any easy day with your family,” said Abramson. A game at Fenway Park in Boston or Yankee Stadium in New York will set you back a lot more. The numbers for a family of four including parking, tickets, food and souvenirs: $345 for a Red Sox game and $301 for a Yankees game. Hartford Yard Goats General manager Mike Abramson says last year they were sold out for 47 games. They’re hoping to see even more fans get in on the action this year. “It is fun to see the folks you know and the folks whose faces you recognize. But it’s really neat to see people light up when they walk into this ballpark for the first time,” according to Abramson. Abramson added that affordability is the name of the game in minor league baseball. “We know that if somebody comes five times and they spend less money, we’re going to end up with more than if they came one time and spent more money,” said Abramson.